Sign up to receive FREE weekly emails with recipes, coupons and other money saving tips right into your inbox. Become a friend on Facebook too AND/OR join the $5 Meal Plan Family and get meal plans delivered to you each week! My new found love for pressure cooking with an electric pressure cooker has taken the place of my slow cooker. No, I do not have anything against the slow cooker, it is just that the pressure cooker has radically changed the way I cook. And other people I talk to feel the same way! A revolution in cooking is brewing with pressure cooking. There are amazing Facebook communities popping up and so many new pressure cooking recipes are all over the web. When I can cook things in 1/2 the time (or less) than on the stove or in the oven, I am a happy mama. Our lives are busy. We have kids in school and sports. Like Erin, I have a big family, I have 3 kids, one less than Erin, but they keep our weeknight schedules pretty full. Between basketball and homework and even at one point Lego Robotics practices! We had something every day of the week except for Sunday at this point. So cooking fast was, and is, super important for my weekly cooking plan. Where I could use a slow cooker, I have replaced it with a pressure cooker. Food texture and flavor is so much better than in a pressure cooker. And it is so easy to come home, load the pressure cooker, set the time and pressure and go pick up or get homework done while dinner is cooking without need for my attention! And another upside is that I like to cook homemade as much as possible. The pressure cooker allows me to do just that in the midst of chaos. 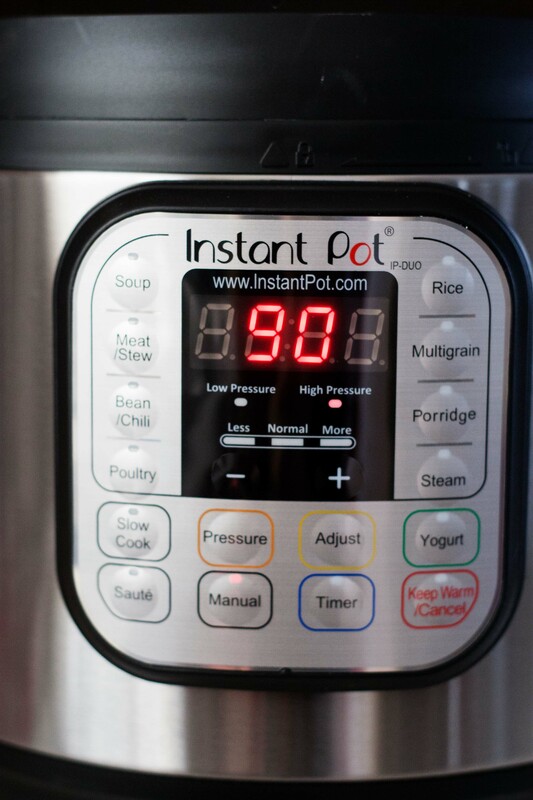 I use the Instant Pot 7-in-1 Cooker (that does the job of a slow cooker, electric pressure cooker, rice cooker, steamer, yogurt maker, sauté/browning pan, and warming pot all in one). 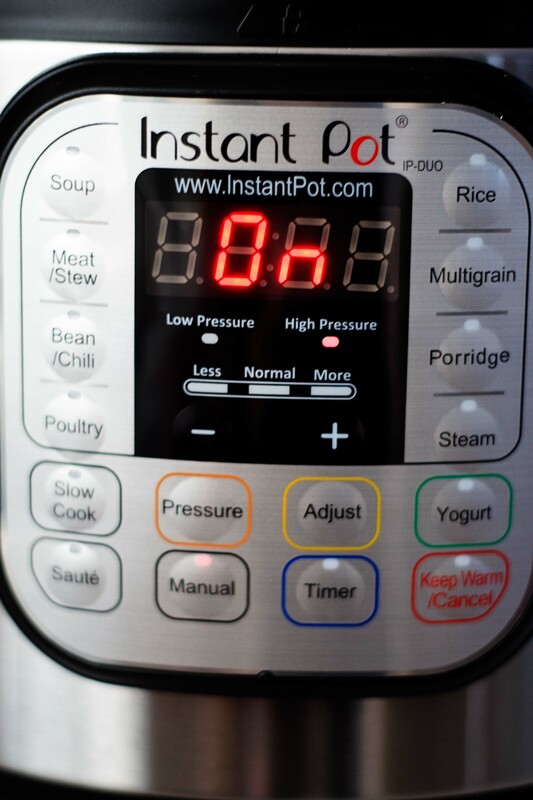 You can adjust just about any stove-top, oven or slow cooker recipe to be cooked on the pressure cooker setting. I am not even kidding you, you can cook one pot meals faster than you would ever think. I chose a recipe for this post that does take more time than most things, but that is because I am taking a 3 hour recipe and reducing the time by half. Seriously, how cool! The other reason I chose this is because when I can cook once and get more than one dinner out of that, you can hear this basketball mom yell SCORE! (well in my mind). This is my superpower! I will provide a slow cooker recipe at the end, in case you do not have a pressure cooker (yet). Mix together store in a small jar with spices. 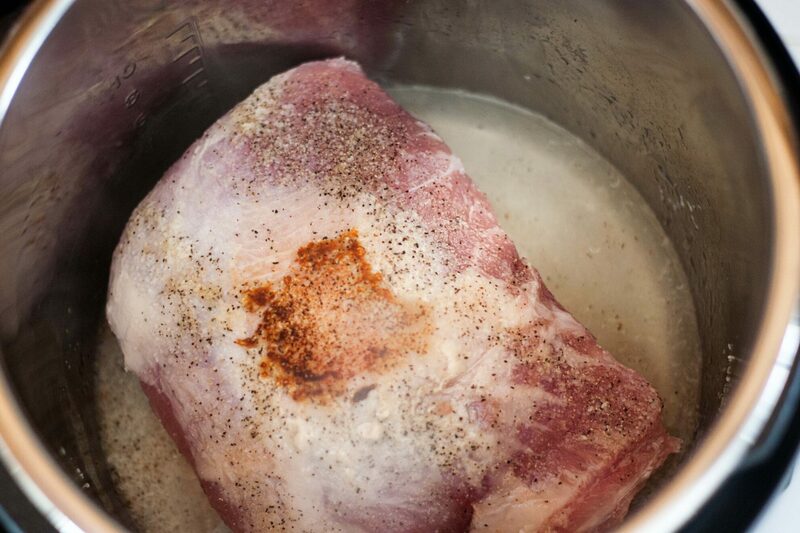 Remove the pork shoulder from the fridge 30 minutes prior to cooking. Cooking meat that is cold can cause it to shrink and be tough. Set the Pressure Cooker to Saute on Highest setting, on the Instant Pot: Press “Saute” button, then the “Adjust” button, until the “More” is selected. Heat until the screen says HOT, add the oil and then place the pork in the pot and saute for 3-5 minutes. Flip and add the broth. For an Instant Pot press “Cancel” (to turn to off). Adjust the Time with the + button and set the time for 90 minutes. Make sure the Steam Release knob is set to “Sealing. 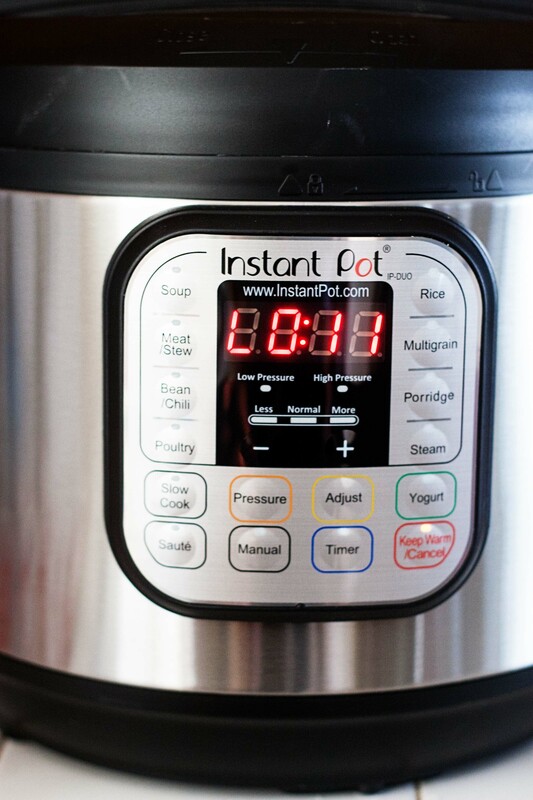 In 10 seconds the Instant Pot will turn to ON. Once it comes to pressure you will see the cook time display and begin to count down. When the cooking cycle is done it will sound a series of beeps to indicate the time is done. Once the cooking cycle is done, the display begins to count minutes. For larger cuts of meat, I do a Natural Pressure Release (NPR) for 10 minutes. This means do not do anything until the display time reaches 10 minutes, then move the pressure release knob to “Vent” to release any remaining pressure. (The Instant Pot will naturally release pressure once the cooking cycle is done.) Some recipes call for Quick Pressure Release (QPR) and this means that once the cooking cycle is done move the pressure release knob to vent right away and release all the pressure. 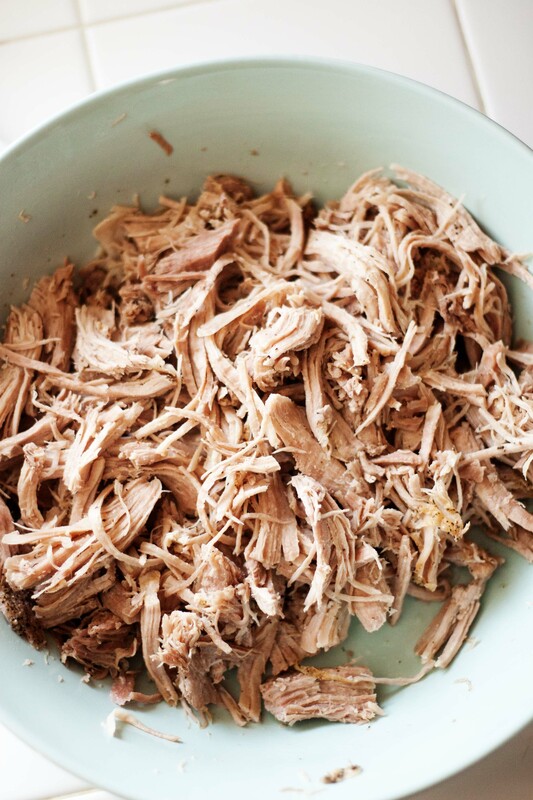 Shred pork once done and use in a variety of recipes including Pork Nachos, Gyros, Carnitas and more! Follow the instructions for the pressure cooker version. Once the roast is browned, add it to the slow cooker with 1 cup of chicken, beef or vegetable broth. Cook on high for 6-8 hours or on low for 8-10 hours. Shred and serve! Now onto a delicious Pork Carnitas recipe that you can make using the above recipe for all-purpose pork! Toss the pork with a few tablespoons of taco seasoning. Add the oil to the pan and then cook the pork until it starts to get crispy pieces. Flip to crisp up both sides. Serve with your favorite taco fixings and tortillas. Are you cooking both pieces of meat? I didn’t think that was clear enough. Thank you. I am so excited to see a pressure cooker recipe here. 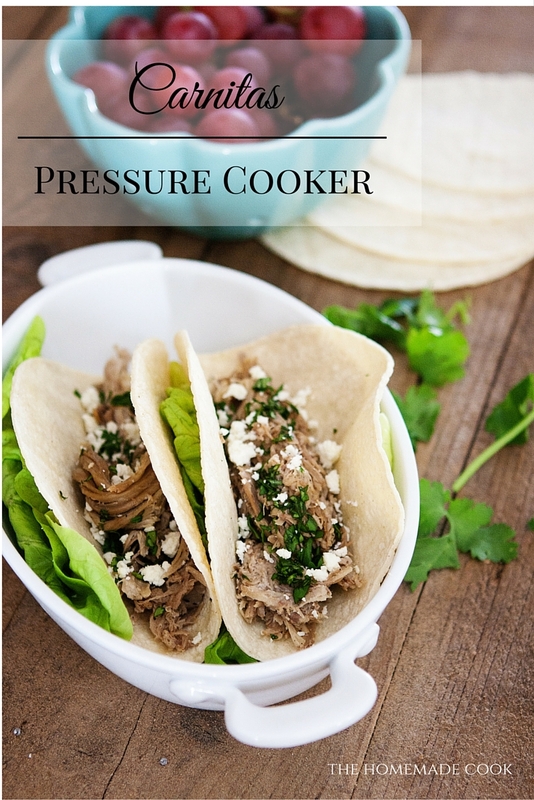 I have been pressure cooking pork shoulder for years and it is always so good. I have a little problem. I cannot make a meal that costs more than $5. It’s unnatural, but my pocketbook thanks me.